When a bone in the body cracks or breaks it is called bone fracture. When a bone fracture occurs, it causes dreadful pain, redness, warmness, swelling, and a little numbness, itchy or paralysis over the injured part. Most of the times, the person cannot move the part that is affected, as it is too painful, warm and tender to touch. As we grow up, our bones get weaker and more breakable, and they take long time to heal themselves. Bones in human body have the incredible natural ability to heal themselves, and this healing begins immediately after fracture occurs. But, doctor’s, especially orthopedic’s treatment is strongly recommended to ensure that the broken bones are properly aligned. Fracture is very common in young children and old people. However, anyone can suffer a bone fracture. Our bones lose their thickness and solidity gradually after the age of 30 in every gender, men and women. 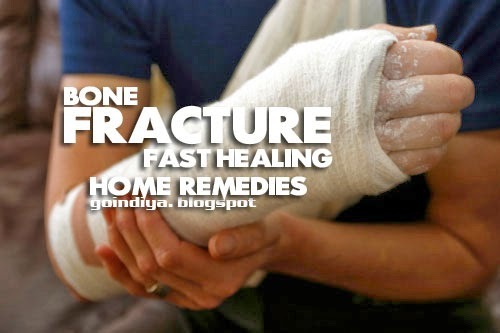 There are many simple home remedies and tips available to speed up fracture healing. 1. Eat half ripe pineapple daily until fracture totally healed. Avoid consuming canned or processed pineapples. 2. Consume glass of pineapple juice every day in the morning and in the evening. Add ½ teaspoon of black salt/rock salt and 1 tablespoon of raw honey in the juice. 3. Drink mixture of carrot juice and pineapple juice very day. Add pineapple in your regular fruit salad. 4. Dark leafy green vegetables such as kale, collard greens and turnips. 5. Fish, like salmon, sardines, perch, rainbow trout etc. Increase your calcium intake along with magnesium and phosphorus intake. Raise intake of vitamin A, D and K. These vitamins and minerals are very essential to repair bone fracture, retain good muscle and fast healing. Vitamin D food – cod liver oil, fish, fortified cereals, oysters, eggs, mushrooms, tofu, soy milk, salami, ham, and sausages, fortified dairy products etc. Vitamin K food - spring onions, dark leafy greens, Brussels, sprouts broccoli, paprika, curry leaves, chili powder, asparagus, cabbage, cucumber, prunes etc. Place zip locked ice bad on the affected area for 15-20 minutes. Do this for first few days regularly. This technique also works even if you have plaster. Just place a towel between plaster and the ice bag to avoid moisture. 1. Avoid consumption of foods with preservatives, these food contains Phosphorous which cause bone loss and it slow down the healing. 3. Raise consumption of high in calcium foods and the other nutrients required for calcium's absorption. 4. Eat green leafy vegetables (except spinach), collard greens, romaine lettuce, kale, and others, are significant for their vitamin K substance, which supports bone formation. Nuts, oyster, salmon, soybeans, tofu, broccoli, yogurt etc. 5. Avoid high salt intake as it is linked to bone loss. Do not consume processed foods, they are generally loaded with salt, and. 6. Eat food with essential fatty acids, such as almonds, walnuts, flaxseeds and fish like salmon, tuna, mackerel, etc, these foods are essential for healthy bones.